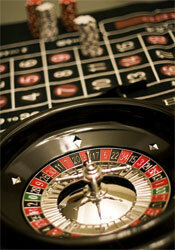 The popularity of the casino roulette game has grown ever since it was introduced in France in the early 18th century. Since then it has spread all over the world, and different classical roulette game variations have been established with their own specific features but actually having the same basis. These variations are: European roulette, American roulette, French roulette, Royale Roulette, Mini Roulette and No Zero Roulette. European roulette is actually the most popular variant of the casino roulette game as it offers better odds compared to its American counterpart. The European roulette wheel has only one zero slot, so the number of red and black color slots on the wheel equals 37 (36 numbers plus '0'). For this reason the house edge (the advantage of the casino over the player) in European roulette makes only 2.67%. Maximum payout in European roulette is 35 to 1 for Straight bets (bets for a single number). Roulette came to the south of the USA with French immigrants in the end of the 18th century. From New Orleans which at that time became an American gambling capital, it has spread to the whole territory of the United States. Still, the American roulette game variant yields to European roulette as it has higher house edge. Due to the fact that American roulette wheel has two zero slots - '0' and '00' - the house advantage in this game variant makes 5.26%. This variant of the casino roulette game is pretty similar to the European roulette with a couple of slight differences. First of all, all terms in the French roulette game are in French. That is why playing this roulette game it is important to memorize some French counterparts of the bets' names, such as Pair for Even and Impair for Odd or ManquÃ© for Low and PassÃ© for High. Besides, the table layout for French roulette is designed in red color. This does not mean there are no bets on Black especially that the wheel has traditional design with black and red pockets. French roulette game offers two rules to the player's advantage - La Partage and En Prison. In the first case, if the player's bet on any number or group of numbers except zero loses, 50% of his or her money will be refunded. En Prison rule offers a player to postpone the bet for the next spin of the roulette wheel. Royale Roulette and Mini Roulette are roulette variations based primarily on the European single-zero roulette. In Royale Roulette rules are practically the same as in classic European roulette, but it also offers an additional 'progressive jackpot' bet for players wishing to increase their winnings. Progressive jackpot works if the same number comes out 5 times running. Mini Roulette differs from its traditional counterpart in the number of pockets on the wheel. It only has 12 numbers and a zero. This fact make Mini Roulette easier to win as it is more probable that the number from 1 to 12 you bet on will come out, especially if you bet on a group of numbers (like 1st, 2nd or 3rd 6 numbers, Red/Black or Odd/Even). At the same time, Mini Roulette pays less - 11 to 1 for Straight bets is maximum payout here. If you wish to win more playing the roulette, we will recommend you to play No Zero Roulette. This variation of the casino roulette game has zero house edge due to the fact that the wheel doesn't have a zero slot. This way there is a 50% chance that your bet will win. Surely, this doesn't mean that every player will win in this kind of the roulette, just as no casino can work for its own ruin, but your chances of winning can still be higher.